In New Orleans, parties during Carnival season, which runs from Jan. 6 until Mardi Gras, usually revolve around two things: king cakes or parades. We gather at the homes of family and friends to enjoy the traditional sweet cake. Hidden inside each cake is a token, usually a plastic baby. Traditionally, the person who gets the baby hosts the next party and so on until Mardi Gras. Parades begin on Jan. 6 and continue through to Mardi Gras, which in 2017, falls on Feb. 28. The lucky among us know folks who live along or near a parade route and are generous enough to open their homes to family, friends and -- sometimes - strangers. Friends, wearing wigs, hats and wild outfits, come carrying packs of toilet paper (these parties can be BIG, so hosts often rent a portable bathroom for guests), platters of fried chicken and six-packs of beer. Grandmas and toddlers, teenagers and parents, all dance, party and socialize together. By the end of the party, each guest, who has flitted back and forth between the party inside and the parade outside, is festooned with plastic beads, bracelets and baubles that light up and blink -- all caught from the parades floats. If the hosts do it right and the float riders are generous, party guests leave full, happy and loaded down with Mardi Gras booty. If you live outside the city, but want to get in on the fun, we offer guidance below for throwing an authentic Mardi Gras party. We can't bring a parade to you, but we can help you re-create some Carnival revelry. 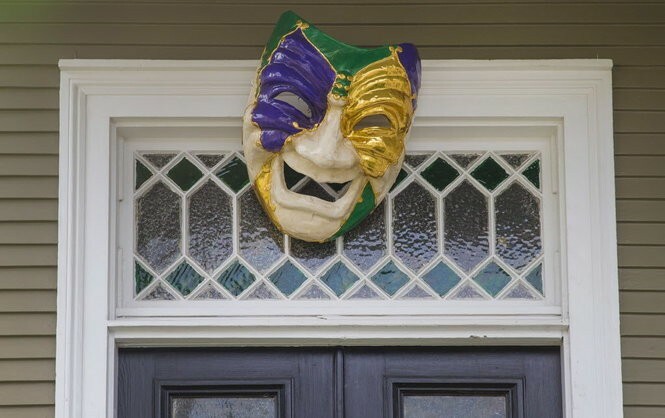 Some of these tips might be helpful to New Orleanians as well. And, New Orleanians: Feel free to share your tips and links in the comments below. First, set the date for anytime between Jan. 6 and Mardi Gras. The day after is Ash Wednesday and the start of the Lenten season. No self-respecting New Orleanian would be caught eating king cake, wearing beads or listening to "Mardi Gras Mambo" after Fat Tuesday. In the Catholic and many protestant churches, the Lenten season starts on Ash Wednesday. It is traditionally a time of fasting, prayer and moderation. 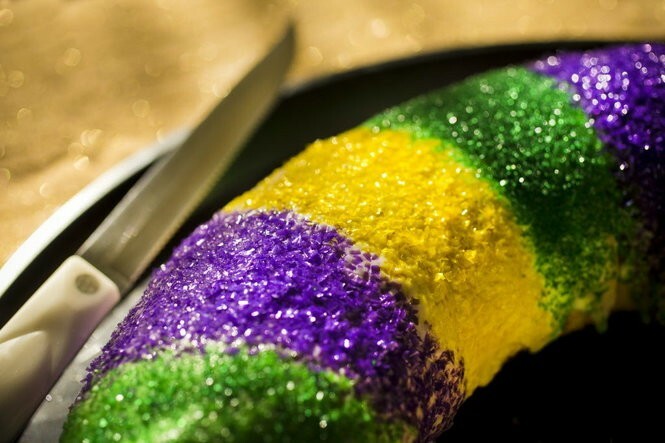 Mardi Gras, which is a moveable feast - that is the date changes from year to year -- is essentially a big celebration of earthly delights before the 40 days of abstinence and reflection of Lent. Make it festive from the get-go with your invitations. You could go the formal route with mailed invites, which is traditional for parties involving Carnival royalty. Or, consider using Facebook or emailed invitations, such as these free ones from Evite.com. Perhaps nothing is more important than the music for getting that New Orleans vibe. If you're unsure what to play, give this Spotify playlist a listen below. It includes gems, such as the Dixie Cup's "Iko Iko" as well as the Al "Carnival Time" Johnson and Rebirth Brass band renditions of "Carnival Time." Other popular suggestions might include: Jessie Hill's "Ooh Poo Pah Doo;" "Joe Avery's Blues (Second Line);" The Hawketts' "Mardi Gras Mambo;" Professor Longhair's "Go To The Mardi Gras;" The Meters' "Hey Pocky Way;" Wild Magnolias' "New Suit;" and Parlez' hip-hop tune "Make It, Shake It, Do It Good." Others to consider: anything by Dr. John, the Neville Brothers, Kermit Ruffins or Juvenile. Don't be afraid, however, to mix it up with your favorite party tunes. The idea is to create a fun, dance-able, upbeat soundtrack. Bonus entertainment: On Fat Tuesday, some New Orleanians start the day before dawn and end the night in front of the TV to watch the meeting of the courts of Rex and Comus. If you want to give your friends a glimpse into the New Orleans traditions, consider streaming the 2017 Rex Ball live on WYES.org/local/mardigras/. You also can find it on WYES' YouTube Channel (search 'WYES on demand' at YouTube.com). For the 21st year, WYES will broadcast the white-tie event live from New Orleans. The broadcast airs on Mardi Gras at 7:30 p.m. and is repeated immediately after airing. The Meeting of the Courts has been a tradition since 1882. The broadcast features vintage Mardi Gras footage as well. Second only to the music is the food. King cake is essential. King cakes are traditionally served for the first time on Jan. 6, or Kings Day, with the last bite taken by midnight on Mardi Gras. A traditional king cake is a braided brioche-style confection topped with icing and colored sugars: purple, green and gold, symbolizing justice, faith and power. Like all yeast breads, making a king cake is a labor of love. But wow, will your friends be impressed. If you have time, you could make one, but why not make it easy on yourself? Here is our guide to New Orleans area king cakes. Many of them ship overnight. You can search by our favorites and by shipping. Find the perfect king cake in our guide. Search by bakery and see if it ships. Find our favorites as well; and ones near you. Big-batch dishes are a fun way to go as well. Keep it casual and easy. Consider red beans and rice, gumbo, fried chicken or jambalaya. Get loaves of crusty French breads or baguettes. Crawfish are in season, so if you're feeling ambitious, order live crawfish and do a crawfish boil. Just note: This requires planning, if you've never boiled seafood before. Learn to boil crawfish at home. Several online retailers, such as CajunGrocer.com, sell ingredients needed for these dishes, including frozen crawfish tails, andouille sausages and alligator. New Orleans is known for its cocktails, but at Mardi Gras, you're more likely to find ice chest of beer and tables filled with a variety of wine bottles. Invite your guests to bring their favorites. Abita is the only Louisiana-brewed beer sold nationally, so you can stock up on that. Louisiana has a growing number of locally made vodkas and rums as well, but they can be tough to find. Consider setting up a Bloody Mary bar, which is popular around the city, especially before daytime parades. Or gather the ingredients and offer a New Orleans cocktail or two, such as a Sazerac, Ramos Gin Fizz, Hurricane, Vieux Carre, Sidecar or French 75. Costumes are de rigueur on Mardi Gras. To encourage folks to dress up, have a costume contest with categories. Give out small prizes. Take a look at the one held on Bourbon Street each Fat Tuesday below. Still, Costumes don't have to be that elaborate. Even outfits worn by average folks show great creavity. Invite guests to express themselves through their costumes. You might encourage riffs on current events. Some New Orleanians go for satirical and funny get-ups. Others strive for beauty and style. You find families or friends in group-themed costumes a well. "If you walk by and men love it, and women love it, and children want to play with it, you know you've done a great job." If you're concerned your guests might need a little nudge, place a costume box at the front door. Buy inexpensive wigs, oversized glasses, boas, tiaras, mustaches and more. Go to the thrift story and pick up a few hats, jackets or other fun items. Let folks pick and choose. Just think purple, green and gold - tablecloths, cups, streamers -- and you can't go wrong. A quick look online will reveal tons and tons of options at sites like PartyCity.com. And, don't just decorate the inside of your house or apartment. Hang large Carnival masks or colorful streamers outside as well. In New Orleans, beads and trinkets are thrown from floats, so by the end of the parade everyone has his or her own to wear. If you are out of town, your guests will likely expect a few strings of Carnival beads. You can easily order beads and stuffed animals online from a variety of sources. 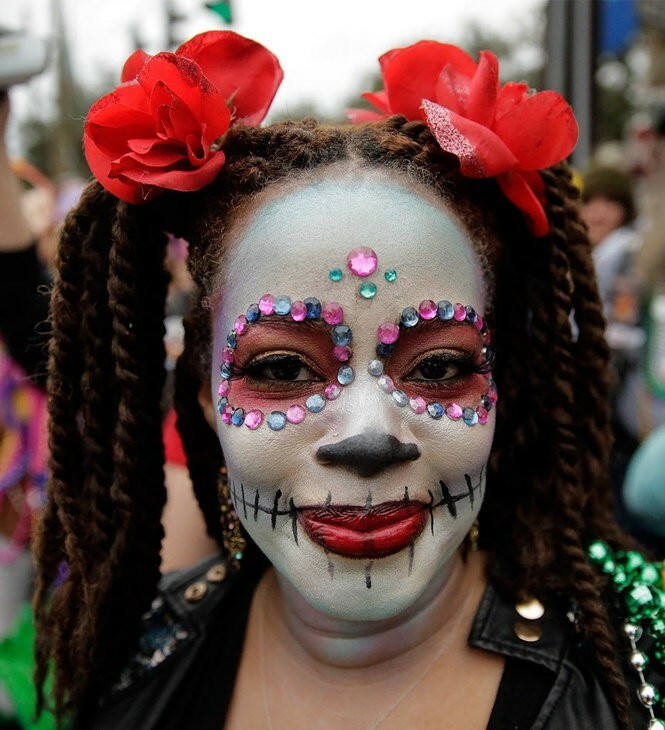 One final tip: Remember, New Orleans is not the only place that celebrates Mardi Gras. Far from it. Mobile, Ala., holds a big Mardi Gras celebration. 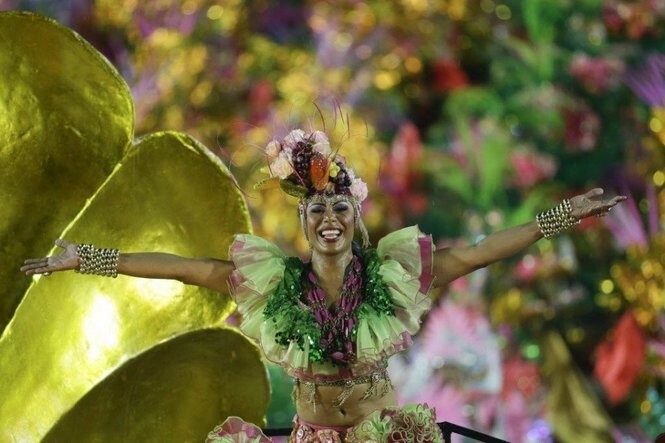 Internationally, well-known festivals are held in Trinidad, Rio de Janeiro, Brazil; Cologne, Germany; and Italy. Check out other cultures as well. You might find fun elements to include.